1970 Administrator Frank Turner and former Administrator Bert Tallamy join in the dedication of the completed Keystone Shortway, a $324-million, 313-mile section of I-80 across Pennsylvania. When Governor Raymond Shafer fires a flare gun, an electronic signal in the Goodyear blimp overhead is activated, officially opening the Milesburg interchange and the highway. Pennsylvania's Name Designation Act of 1984 designates I-80/Keystone Highway the "Z. V. Confair Memorial Highway." It was named after a State Senator who had served as President of the Keystone Shortway Association. 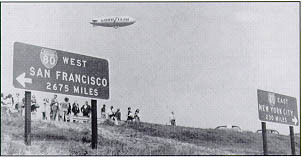 In State College, PA, for "Highway Week," the Goodyear airship "America" signaled the the completion of the 313-mile Keystone Shortway (I-80).